Коло Прави (Kolo Pravi) is a pagan folk Belorussian band that has remained quite unknown so far. The band was formed back in 2006 and released its first demo in 2009! Finally in 2012 they decided to offer us their debut full-length album, the self released “Было. Есть. Будет” (It was. It is. It will be). The band consists of 3 members and its sound has an underground approach. They play melodic folk pagan metal, with many traditional elements in their music. Their compositions are built upon Slavic Belorussian traditional tunes and scales, while they also use several folk instruments. I can’t tell if they cover existing folk melodies, or if they compose their own, but the result is all that matters, and I find it very good! My only problem is the sound and production quality that don’t flatter their music and make most instruments sound like keyboard samples. On the other hand their compositions are really beautiful and variable, with nice orchestrations, many unusual instruments, great lead melodic parts, calm acoustic folk passages and faster pagan metal outbursts, keeping the album always interesting for the listener. Коло Прави sing mostly with clean male vocals, but they also use pagan black metal screams and some female vocals. All vocals sound very natural, like they are sang live and not in a studio, something that except for a few parts, works perfectly for the overall atmosphere of the album. ”Было. Есть. Будет” lasts for almost 48 minutes and its 11 songs are inspired by Slavic mythology, nature and epic themes. No need to mention the lyrics are in their native language. “Было. Есть. 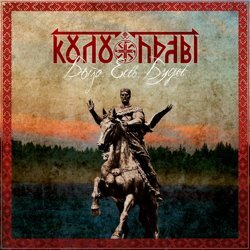 Будет” is another good album of the vast Slavic pagan folk metal scene. If Коло Прави improve their sound, I am sure they will make much better albums in the future! Their debut is self released in a probably self-printed CD-r that comes in a standard jewel case edition with 2-page booklet. You can visit their official pages below and listen to their music or find more info about them (if you speak the language). If you are interested in getting the CD, you better try to contact the band directly.